Customize the client record detail page. Describe client and household rollups. Financial Services Cloud comes ready to use, but what if you want to customize key pages? For instance, you can customize a page by adding standard or custom components to change a page’s functionality for all your users. Or you can have users with different profiles or in different apps view custom-tailored versions of a particular page. Once you decide on the page to customize, you can either edit the existing page, or create one from scratch using the Lightning App Builder. The client page is where advisors go to see the most important and relevant data about each customer. This data can include their financial accounts, goals, or relationships. But the type of data your advisors consider most important can be different from what’s on the standard page. Never fear, because you can customize this page to make your advisors happier and more productive. Matt, the admin, is going to customize this page. Why? He has a lot of advisors who view the client page on their phones. 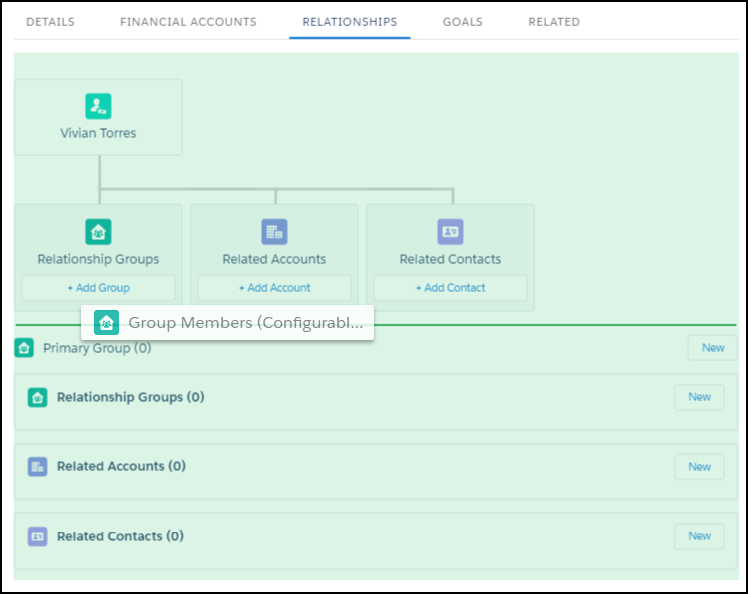 The current Group Members component on the Relationships tab displays all the information for each member, and the advisors have to scroll down through it. They’d like to be able to collapse group members when they want so they don’t have to scroll so much. Their thumbs are getting tired from all that scrolling! Matt wants his advisors—and their thumbs—to have a painless experience, so he promises to help. He can build a component, but first he checks the current list of components. In that list, he discovers a prebuilt Group Members (Configurable) component that provides the desired functionality, plus more. He decides to swap out the old Group Members component for the new Group Member (Configurable) one. He makes this change with ease, using Lightning App Builder and drag-and-drop. Let’s step through and see how he did it. In the Quick Find box, enter Lightning App Builder, then select Lightning App Builder. Next to the Client Record page, click Clone. Click Relationships in the body of the client record page. Drag the Group Members (Configurable) component from the Custom Managed list to the client record page under the relationship tree. The Group Members (Configurable) component displays as a Primary Group component. Remove the old component by selecting the second Primary Group component and clicking the X. It is the second component under the Relationship tree, between the new one you dragged over and the Relationship Groups component. On the Page Saved dialog, click Activate. In the Activation dialog, click Assign as Org Default to define the place where this page is used. In the Set as Org Default dialog, click Save. In Financial Services Cloud, clients have tasks, events, and financial accounts. All this data is aggregated or “rolled up” into the client’s financial summary. The summarized data makes it easy to see a client’s complete financial picture. A client’s data can also be summarized with the data of others by making a client part of a group. When a group is a client’s primary group, all the client’s financial information is usually rolled up into that group. For example, the Adams Household is Rachel Adams’s primary group. It is also her husband Nigel’s primary group. Because they are in the same group, Nigel and Rachel’s information is rolled up together. Having that data in one place makes it easy to understand Rachel’s financial information in context with the rest of her household. What happens after advisors add clients to a group and set the group as the client’s primary group? They can choose what to roll up into the group. Each client can have one primary group. One thing to note is that you can only set rollups to the primary group. If the Primary Group field is not enabled, the option to roll up is restricted. We discuss rollups in more detail in the Financial Services Cloud Data Modeling module. For now, let’s take a look at the dialog where your advisors choose what gets rolled up when a person is added to a group. The Activities & Objects to Roll Up menu shows what data from the client rolls up into the group. You can customize what items appear in that menu by changing the order of menu items. You can also remove certain menu items from your org. Matt’s advisors have told him that they would like to focus on the financial accounts first. That’s what they work with the most when setting up rollups. Right now, those menu items come last. So Matt decides to move the Tasks and Events items to the bottom of the menu so the financial information options show up first. How do you do something like that? At the top of the page, select Object Manager. Select Account Contact Relationship, then select Fields & Relationships. Next to Values, click Reorder. Move Tasks down to the bottom of the list. Move Events down under Tasks. Click the App Launcher ( ) in the upper left corner and select Wealth Management. Click Accounts and select All Accounts in the picklist at the top of the page. Then select Rachel Adams and click the Relationships tab. Scroll to the bottom of the Adams Household and click Add Relationship. Open the Activities & Objects to Roll Up menu next to Rachel Adams. As you can see, the Tasks and Events menu items have moved right down to where you put them. Congrats! How are rollup summaries defined for client and group financial accounts, assets, and liabilities? By the custom objects: Rollup By Lookup Config and Rollup By Lookup Filter Criteria. These objects enable calculation of rollup summaries based on lookup field relationships between objects, rather than master-detail relationships. While you can’t customize rollup configurations, Financial Services Cloud provides several out-of-the-box rollup summaries at the person and group levels, including the following. Now that you know how to customize pages and set up rollups, you’re ready to move on to customizing Einstein Analytics.